Poipu Kai Resort is a 70 acre development in Poipu consisting of several unique condos, a residential area with homes, a large tennis facility (Poipu Kai Tennis Club), and garden paths connecting the areas of the resort. 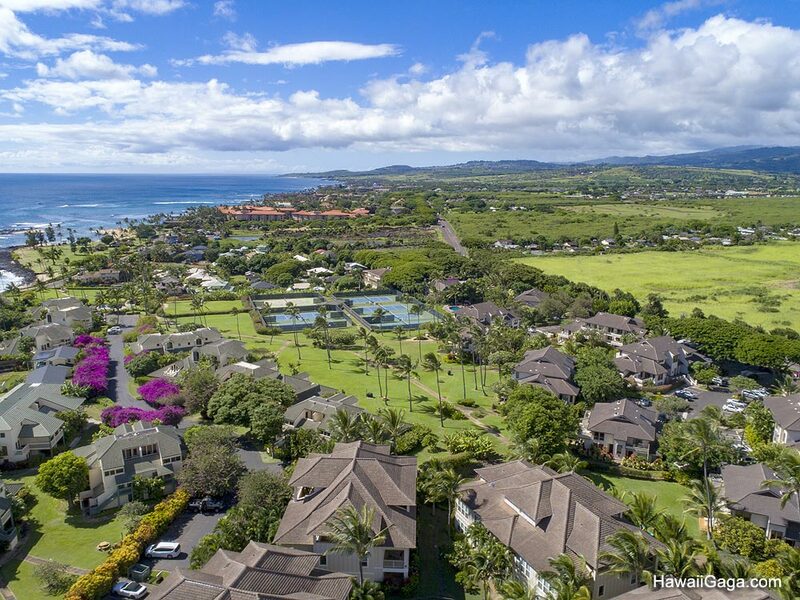 As can be seen in the aerial photo below, the resort extends from Poipu Beach Park to Shipwreck beach. People choose Poipu Kai Resort because the location is excellent - being close to Poipu Beach Park as well as Shipwreck beach and the Grand Hyatt, and walking distance to several restaurants. The condo complexes feature spacious units with a variety of options and views and are able to accommodate all budgets and tastes, including those who want a rental with air conditioning (a rarity in Poipu). Each condo has its own swimming pool. The photos and maps on this page will help you get an idea of the layout of the resort. We have separate guide pages for each complex with more information including aerial photos, and you can browse the individual rentals at each complex. The Poipu Kai Resort map below shows the layout of the resort and location of each condominium complex. It's less than a mile from Shipwreck beach to Brennecke beach (and Poipu Beach Park), and takes about 15 minutes to walk from one end to the other when you cut through the walking path of the resort.